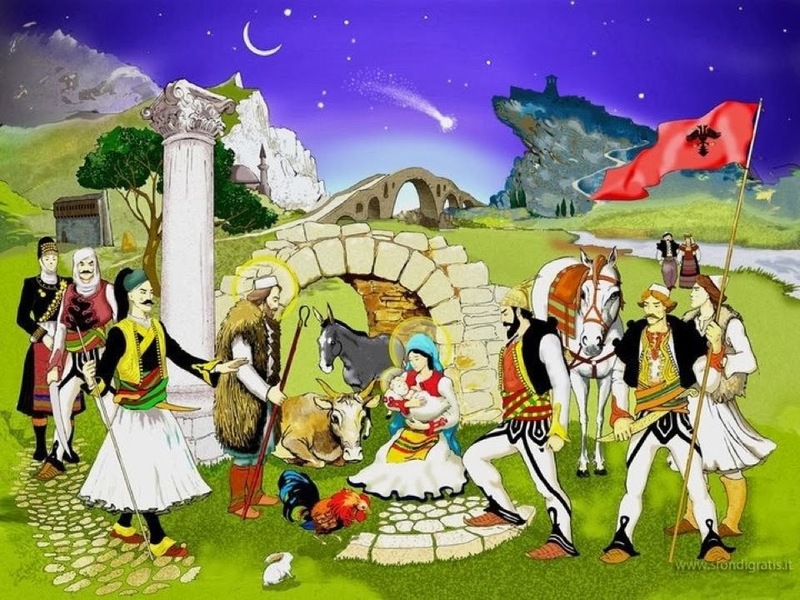 This illustration shows the disparate influences which have molded the Balkans - Ottoman Empire on the left with the crescent moon signifying Islam; woman holding a child in a manger signifying Christianity in the middle and the man carrying a flag of the Austro-Hungarian Empire on the right. In the background is probably the Latin Bridge in Sarajevo. On 28 June, 1914, Archduke Franz Ferdinand of Austria, the heir to the Austro-Hungarian throne, and his wife, Sophie, Duchess of Hohenberg were assassinated in Sarajevo, Bosnia. The Archduke was shot dead on the Latin Bridge by Gavrilo Princip, a Bosnian Serb, and the assassination came to be known as the Sarajevo Incident. The motive for the assassination was to free the Slavic countries from the Austro-Hungarian Empire and create a greater Serbia or Yugoslavia. This event is believed to have led directly to World War One and used frequently by proponents of the Lynch-pin Theory or should I say, hypothesis? According to this hypothesis (I'm not even sure if it's real or made up by TV scriptwriters!) a single event could trigger a chain reaction of catastrophic proportions as was surely the case here. Another book I've read is Eric Ambler's The Mask of Dimitrios. I loved this book but modern readers tend to find the protagonist as fumbling and annoying as he prefers talking to action and has a knack for getting himself into danger. Nevertheless, The Mask of Dimitrios, is considered a forerunner in the spy thriller/espionage fiction and the idea of a ruthless but highly intelligent assassin behind certain events. 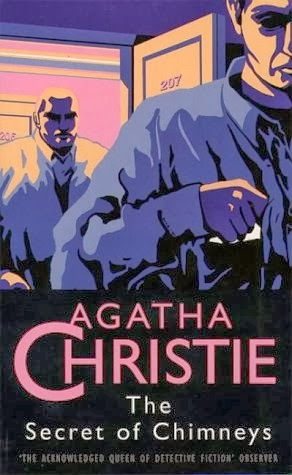 It may have been the model for works such as The Day of the Jackal by Frederick Forsyth. However, according to some friends from the diplomatic community, the most important book about the region is The Bridge on the Drina. The novel by Yogoslav writer, Ivo Andric, was published in 1945. 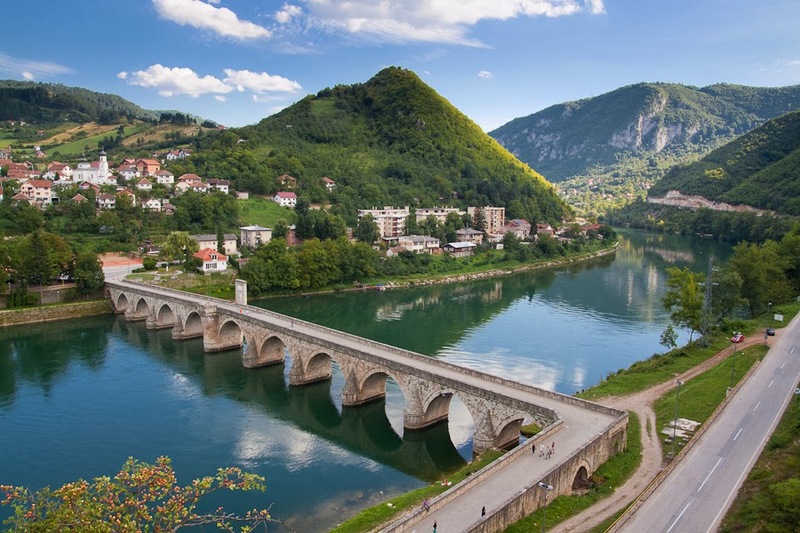 It is about the Mehmed Pasa Sokolovic Bridge, a real-life bridge spanning the Drina River near the town of Visegrad in Bosnia. The story spans four centuries from about 1500 - 1900, when the region was under Ottoman rule and later Austro-Hungarian rule. Ivo Andric was awarded the Noble Prize for Literature in 1961 for his body of work. The story starts with a Serb boy being taken from his village as part of the blood tax - Christian subjects of the Ottoman Empire are required to hand over a few of their boys every year to serve the empire. The boys are not doomed to a life of servitude and slavery, on the contrary they are educated, thought martial skills and horsemanship. The strongest and bravest grow up to lead the Sultan's army while the ones with sharp minds and quick wits are groomed to be administrators to run the Ottoman Empire. The mothers of these boys follow them, wailing in grief, until they reach the river where the children are taken across by boat and the mothers can no longer follow. That child is educated in the Ottoman Court and later takes the name of Mehmed Pasa Sokolovic and eventually becomes the Grand Vizier of the Ottoman Empire for almost 15 years. But the memory of his mother wailing still haunts him and he decides to build the most magnificent bridge over the Drina River in memory of that event. The bridge was completed in the year 1570, with much difficulties and sacrifices. Apparently, children may have been entombed into the bridge during the construction to ensure that it remains standing. This fact should not come as a surprise as hundreds of people were said to be entombed in the Great Wall of China during its construction too. If I were to hazard a guess, I would say that the spirits of the dead children are supposed to be tied to the bridge and to guard it to ensure its continued existence. 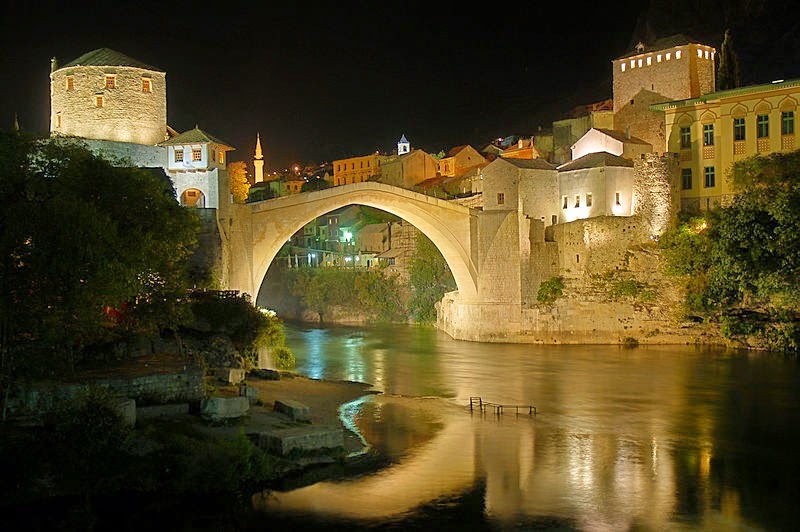 The most famous bridge in the Balkans is however, the Stari Most or Mostar Bridge, which connects the two banks of the Neretva River in the town of Mostar, Herzegovina. 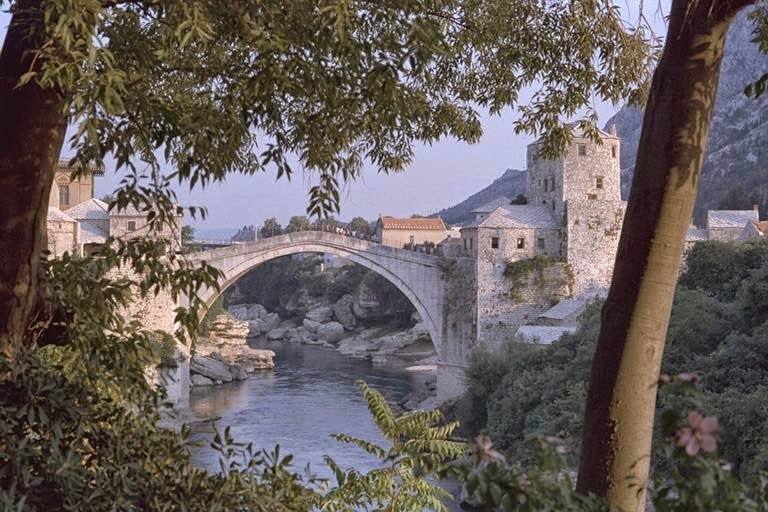 The 427-year old bridge was destroyed on 9 November 1993 by Croat forces during the Croat-Bosniak War, along with a number of historical monuments. The original bridge was built in the 16th Century and considered one of the outstanding examples of Islamic architecture in the Balkans. It was designed by Mimar Hayruddin, an apprentice of the famous Ottoman architect, Mimar Sidan. Two fortified towers protected it: the Helebija tower on the northeast bank and the Tara tower on the southwest bank. The towers are the bridge keepers or mostaris. The bridge was commissioned by Suleiman the Magnificent in 1557 and completed in 19 July 1566. Legend has it that the architect was charged under pain of death to construct a bridge of unprecedented proportions. When the scaffolding was finally removed the bridge became an object of wonder and was the widest man-made arch in the world, during its time. The new Mostar bridge at night. Copyright Wikipedia. 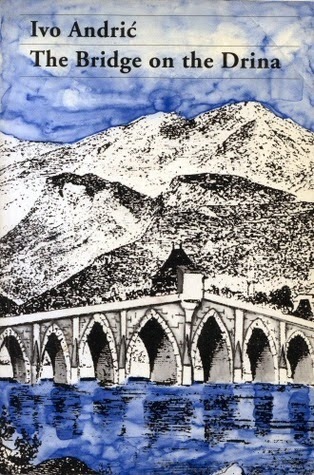 The new Mostar bridge was rebuilt after the war, using Ottoman techniques and utilising the local stones used in the original bridge. 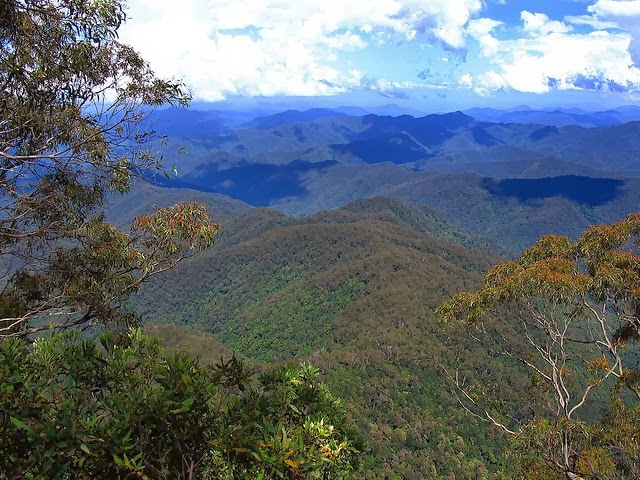 It was completed in July 23, 2004. 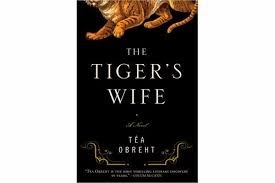 The book which takes us to modern day Balkan is The Tiger's Wife by Tea Obreht. 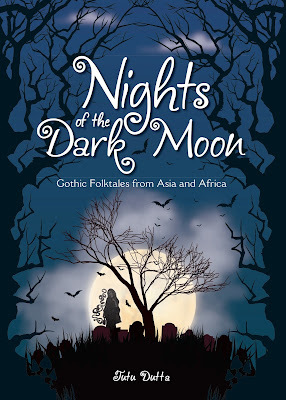 Published in 2011, the book garnered the Orange Prize for Obreht, making her the youngest person to win this award to date. The author was born in Belgrade, but is of Bosniak/ Slovene descent. As she left Yugoslavia at the age of seven, Obreht did not witness the war, which is the setting for the book. A friend of mine, Alena Sanusi, asked me if I knew which city the story was set in. 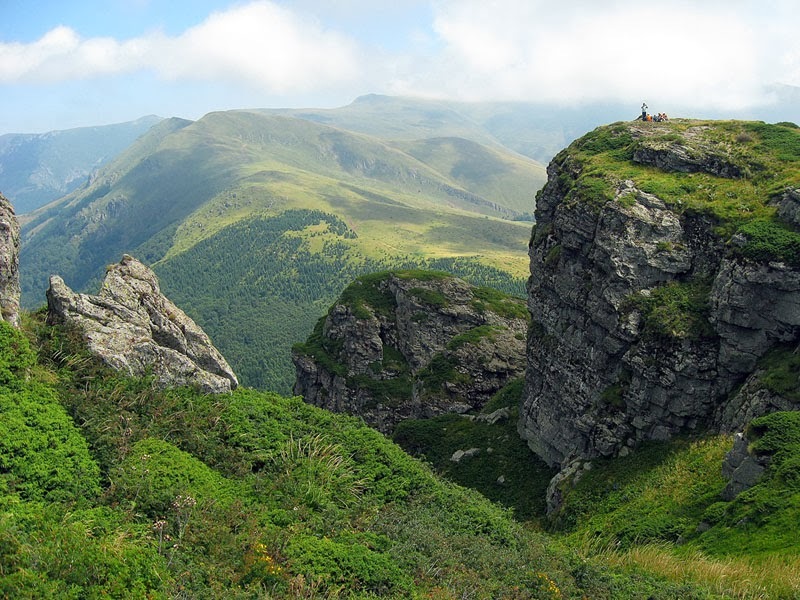 I looked up old fortresses in Balkan cities which had zoo in it and came across Kalemegdon Fortress. 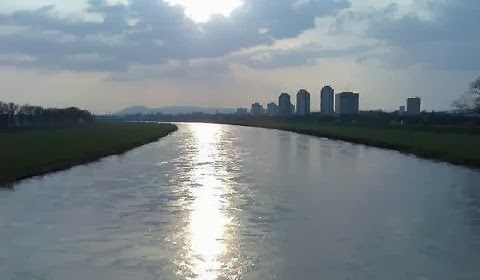 Kalemegdon is situated on a hilltop, right in the middle of Belgrade at the confluence of the Danube and the Sava River. 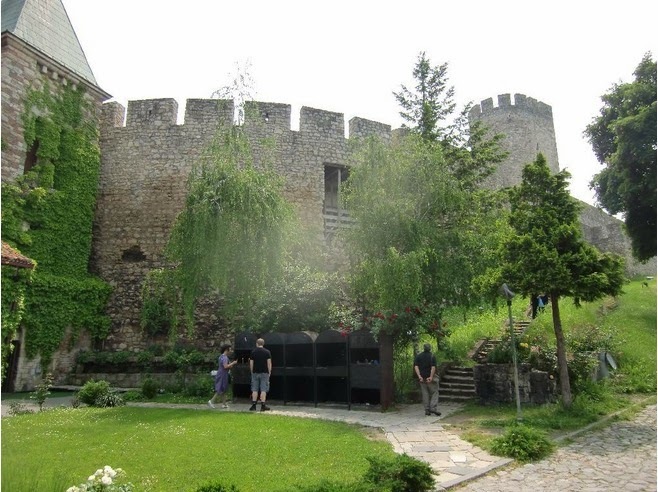 The fortress dates back to the early Middle Ages but more importantly, it was captured by the Ottomans in the 16th Century and remained in Ottoman hands for three centuries. To return to the story, Natalia is caught in the Yugoslavia war. At the end of the war, she visited the village of Galina, the birthplace of her grandfather, as part of a humanitarian medical group to help the villages. In the village, she is shocked to find out that the story of the tiger's wife was not a fairy tale after all. I love this blog. More please. Thank you, Ruth Leader. I will check out your blog soon. Tutu, what an excellent blog. Now that I have subscribed to it, I will receive updates on gmail and may not need to look at facebook.